Foam, lycra, neoprene and skeleton plastic shell gloves available. Customised, protective and comfortable fit. Calf and sheep leather palm available in pittard style. Moulded Gloves, Left hand fully protected with Thick foam sheet, Right hand shaped to hold Stick & shaped fingers ideal for Clubs & Ladies in Medium & Large Sizes. We provide various ranges of hockey gloves. Our range of hockey gloves used in hockey to enhance the player performance. Our hockey gloves are manufactured keeping in mind to safeguard the hands of the player from the puck, sticks and the skates of other players. 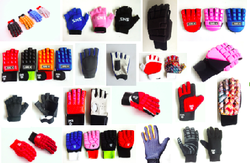 We are manufacturing and exporting hockey equipments such as hockey gloves. 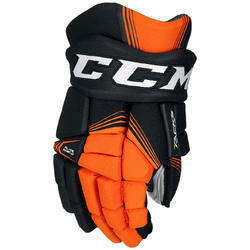 Our company brings forth an array of Hockey Gloves in different sizes and color combinations. These are precisely engineered keeping in mind the safety of users from quality proven materials. Our range provides maximum protection due to its excellent gripping. We deliver them only after the strict quality checks to ensure various quality features.